Based on Philip Reeve’s 2001 novel, Mortal Engines feels like a film that missed its moment. Its mixture of post-apocalyptic steampunk and young adult romance would have been a recipe for success circa 2008. Ten years ago, this film would have been an event. But today, it feels like missed attempt to capture a bygone cultural zeitgeist. Mortal Engines is visually astounding, but disappointingly familiar. It’s big and it’s loud, but it doesn’t have anything new to say. A thousand years after humanity nearly destroyed itself, most of the remaining population live in roving, mechanical cities. The largest: London, swallows entire cities, tearing them apart for fuel. At the helm is Thaddeus Valentine, played by Hugo Weaving who left his subtlety pants at home. He’s scrounging ancient tech in hopes of building a machine that will ensure London’s survival. The rusted mechanical wheels of this story get moving when a masked assassin, Hester Shaw (Hera Hilmar) attempts to kill Valentine. She’s foiled by museum assistant and wannabe pilot Tom Natsworthy (Robert Sheehan). His reward is to be thrown off London and left for dead in the wastelands where he and Hester attempt to uncover what Valentine is planning and stop it. The advertising for Mortal Engines has plastered Peter Jackson’s name all over this movie, but the film itself is directed by Christian Rivers, a veteran of the arts and visual effects departments. It’s no surprise than that the film looks spectacular. The visual effects artists at Jackson’s Weta Workshop have worked their distinctive brand of magic to bring the film’s enormous moving cities to life. Mortal Engines is the kind of film that should be seen on as big a screen as possible. The people who will eventually watch this film on their phones and laptops will miss out entirely on the reason why the film exists: its spectacle. When you strip that away from it, there’s not much left worth engaging with. Mortal Engines comes in at a relatively brisk 128 minutes. Now that might soundslike a fairly hefty running time, but this is a film co-written by Peter Jackson – the man who never met a movie he didn’t want to add 45 minutes to. If I had to venture a guess, I’d say quite a bit of footage never made it on screen. 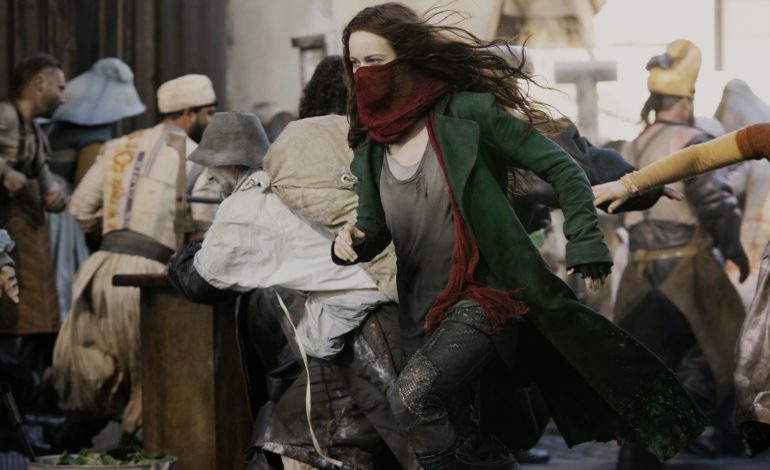 As is, Mortal Engines moves at such a breakneck pace, there’s little time to enjoy its intricate world and marvelous production design by Dan Hennah, and even less time to get to know any of the characters. The film has a massive cast to match its enormous landscape. There’s Katherine – Valentine’s rebellious daughter, Bevis Pod – Tom’s mechanic friend, Anna Fang – an ‘anti-tractionist’ terrorist who leads a merry band of rebel fighter pilots. Most interesting is Shrike, an undead assassin played by Stephen Lang with a murderous fixation on Hester Shaw. The film cycles through characters and locations, that it’s impossible to develop any emotional attachment to anything. If there’s one character we’re meant to develop an attachment to, it’s Hester Shaw. She’s a potentially fascinating character, but the film is is too interested in keeping her backstory a mystery to make her an engaging protagonist. The role if filled by the bumbling wannabe pilot Tom, but there’s really not much to say about him other than his character’s big moment is putting on a jacket. The focus is clearly meant to be on Hester but we only get slow drips of her motivation, each more half-baked and ill-explained than the last. A brief word about Hester’s facial scars that have been the source of some online outcry. For those unfamiliar with the film’s trailer, Hester has a scar that crosses her chin and cheek, in the novel she is missing most of her nose and blind in one eye. While I haven’t read the novel, I’m familiar with plenty of books whose adaptations made their character’s more attractive – from Hermione Grainger’s buck teeth in Harry Potter to Art3mis’s birthmark in Ready Player One. Personally, I can’t really blame the filmmakers for wanting the protagonist of their $100 million young adult film to be attractive. Thankfully the film’s script does Hester the courtesy of not laboring her with a complex about her looks. If I were a fan of the book, I’d care less about Hester’s scar and more about the film she’s forced to be in. Mortal Engines is an unfortunate contradiction. The film’s jaw dropping visuals meant to be seen on the biggest screen possible, but its writing feels much more like straight to VOD fair. That makes it really hard to recommend to either audience. The film’s marketing hailed Mortal Engines as the next Lord of the Rings, but its fate will likely be similar to Jackson’s Lovely Bones – a clunky adaption of a beloved book that we’ll all forget about in a few years’ time.